Nearly all the following was given me by Samuel Rankin Latta of Dyersburg, Tenn. It was taken from an old family Bible (1903) in his possession and has been a family possession for several generations. It was presented in London, England in 1602 of the Geneva translation and known as the "Breeches" Bible. John Gilchrist Latta says: "At the top of the page the name of Thomas Sandie is written. He was a relative of the family and from whom the book was probably handed down. The paper is the book is decaying and one of the dates is not perfect. I cannot be sure of my great grandfather's name. The initial letter is "E, but I cannot determine the remainder of the name." It may be Ephraim or it may be Eben as he named one of his sons Eben. 2 EBEN (2) b. February 19, 1744. 3 MARY (2) b. September 16, 1747. 4 JANE (2) b. February 20, 1749. 5 JOHN (2)b. Oct. 22, 1754 in Westmoreland Co., PA.
6 MARGARET (2) b. December 25, 1751. ____ (1). Born in Ireland October 22, 1754; d. in Westmoreland Co., Pa. prior to November 23, 1802 as letters of administration were then granted to his widow, Mary Latta, James Parr and John Woods. He was accidentally killed while erecting a mill on Lyalhanna Creek, Westmoreland Co., Pa. Married Mary Rankin. She was born about 1753 and died January 25, 1826, aged 73 years at the home of her son, John (2d) in New Alexandria, Pa. He also lived in Salem Tp. Pa. Millwright. His descendants do not know anything of the history of him or his wife or of his other children except John (2d) and that one of the girls married a man named Rankin perhaps in Indiana or in Westmoreland Co., Pa. She left one daughter, who died at an early age at New Alexandria, Pa. John came to America sometime between March 21, 1789, the birth of his son, John (1st) 1789 in Ireland and the birth of his son Ephraim (2d) in America in 1792. He first settled in Lancaster Co., Pa. and afterwards in Westmoreland Co., Pa. where he died. He assigned land warrant dated April 3, 1769(?) to land in Indiana Co. then Westmoreland Co., Pa. Gov. John Latta, branch No. 10. 7 GINNEY MARY (3) b. in Ireland November 15, 1783. 8 PEGGY (3) b. in Ireland August 15, 1795. Came to America. John Hart, guardian. 9 EPHRAIM (1st) (3) b. in Ireland May 21, 1787. Died young. 10 JOHN (3) (1st) b. in Ireland March 21, 1789. Died young. 11 EPHRAIM (3) 2d. b. in America July 3, 1792. 12 POLLY (3) b. in America November 12, 1793. 13 JOHN (3) 2d., b. April 15, 1796 in Lancaster Co., PA.
Guardians of John and Jenny were Col. Alexander Craig, John Hart and Nicholas Day appointed at the March term of the Orphans' Court in Westmoreland Co, Pa.
John (2) ____ (1). Born in Lancaster Co, Pa. April 15, 1796; d. at Dyersburg, Tenn 187_. Married Lucinda E. Gilchrist at Harrisburg, Pa. She was born in Dauphin Co, Pa. March 31, 1793, daughter of John and Ellen Berryhill Gilchrist. Her father was a lieutenant in the Revolutionary War. His widow resided with John 2nd and received a government pension up to her death in 187_. In 1837 John 2d went to Blairsville, Indiana Co., Pa. where his children grew up. He learned the saddle and harness makers trade at Greensburg, Pa. and worked at his trade at New Alexandria, Pa. In 1855 the rest of the family removed from Blairsville, Pa. to Dyersburg, Tenn. Gov. John Latta, branch No. 10, said that John 2d was related to him and to Ephraim Latta, branch No. 10. These two families resided at our place and visited each other. 15 JOHN GILCHRIST (4) b. May 1, 1824; d. May 12, 1901. 16 WILLIAM BERRYHILL (4) b. February 1, 1826; d. Dec. 3, 1877. Buried at the City Cemetery, Dyersburg, TN. Saddle and harness maker. Lived with brother, Samuel R. at Dyersburg, Tenn. in 1880. 16 SAMUEL RANKIN (4)* b. Dec. 2, 1827; d. July, 1911. 18 JAMES MITCHELL (4) b. Oct. 16, 1829; d. 1857. 19 FRANCIS HENRY (4) b. October 28, 1831; died in infancy. 20 FRANCIS HENRY (4) 2d, b. December 5, 1833; died in infancy. 21 JAMES M. (4) . John (3) John (2) ____ (1). Born in New Alexandria, Pa. May 1, 1824; d. at Atlanta, Ga. May 31, 1901; d. May 12, 1901. He is buried at the City Cemetery, Dyersburg, TN His tombstone reads "John Cilchrist Latta. : He married twice: (1) Mary R. Silsby August 14, 1860 at Newton Corner, Mass. She died there October 18, 1870. She was born at Acworth, N.H. December 4, 1830. (2) Ellen F. Dascomb in Massachusetts March 26, 1872. She was born at Antrim, N.H. March 8, 1838 and died i 1922. She is buried at the Parkholm Cemetery, LaGrange Park, Cook Co., IL. He was a saddle maker. In 1862 moved from Dyersburg, Tenn. to Newton Corner, Mass. where he was postmaster for a number of years. Evidently returned to Dyersburg before his death. 1892. In 1904 lived at Hinsdale, Ills. ; in 1912 at Worcestor, Mass. She said that in 1904 Spiaso Latta, an Italian, was murdered in Chicago. This shows the name in Italy. Children: Pauline b. March 24, 1893. Marion b. October 6, 1894. Henry H. b. February 24, 1897. Kathryn b. July 10, 1898. John Otis b. September 30, 1901. 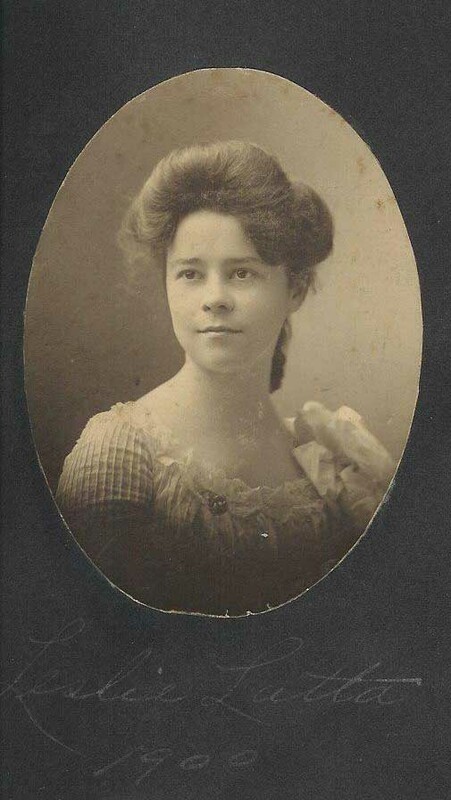 Zella Silsby b. August 28, 1893. Leota Florence b. December 14, 1894. Joseph Charles b.
of Westfield, Mass. Children: Arthur Gilchrist b. September 18, 1888. Mary Silsby b. March 19, 1892. Marion Marsh b. twin with Mary. Harold Hills b. June 25, 1894. Paul Evans b. May 3, 1901. Clarence Gordon b. October 18, 1905. 25 JENNIE LOUISE (5) b. April 6, 1869; d. February 2, 1876. 26 SAMUEL WELLMAN (5) b. March 21, 1876. John (3) John (2) E____ (1). Born in New Alexandria, Pa. December 2, 1827; d. at Dyersburg, Tenn. July 11, 1911; m. Mary Granger Guthrie on December 9, 1852. She was born in East Tenn. of Scotch parents on Aug. 8, 1833. She died on Sept. 8, 1920. They are buried at the City Cemetery, Dyersburg, TN. He took a three year's course at Blairsville, Pa. Academy and taught for 18 years. Graduated at Jefferson College, Cannonsburg, Pa. in 1850. Taught in Dyersburg, Tenn. for three years. Studied law. Admitted to the Bar in 1854 and practiced until his death. His son Samuel G. was his partner. Was a Captain in the Confederate Army during the first year of the war, "TN Capt. 13 TN Inf CW" is on his tombstone. He was a Worshipful Master of the Hess Masonic Lodge. His home located at 917 Troy Avenue, Dyersburg, TN is on the National Register of Historical Places. 27 JOHN GUTHRIE (5) . 28 KATE (5) b. 1859; m. Thomas C. Gordon. Had children. Lived at Dyersburg, Tenn.
29 SARAH KNOTT (5) b. 1862; m. Rev. W. M. Anderson, Presbyterian. Lived at Rock Hill, S.C. One child. 31 FRANK WALLACE (5) b. in 1866; d. in 1936. 32 MARY ELEANORA (5) b. 1864. 33 SAMUEL GRANGER (5) b. 1872; d. 1934.
p. 35 "James Rosser of the Twelfth Tennessee wrote that "the bullets whistled above our heads and our feet...Samuel Latta of the Thirteenth Tennessee wrote that the Yankees were posted in the woods and that the Southerners were subjected to a "perfect hail of bullets from an enemy that we could scarcely see." ...Latta was struck on the hop by a minie ball. He checked the wound, "expecting to find [his hands] covered in blood" but was "agreeably surprised to discover that his watch fob flap had deflected the bullet. Latta was bruised, but not bloodied....Samuel Latta of the Thirteenth Tennessee reported: "we stood behind the trees and shot them down. I saw them fall in my direction." Latta, an officer, rushed up to a fleeing Federal and "seized him by the neck," an action which convinced the Yankee to "surrender without a struggle." Latta wrote later, "The poor fellow was worried [and] frightened to death," a fairly sensible reaction considering the manner in which he was captured. If Latta and his comrades had been nervous earlier, this sentiment appears to have dissipated as they pursued Grant's troops. THURSDAY, JUNE 13, 1907-- Capt. LATTA was thrown from his buggy Tuesday morning in front of R. F. C. MOSS' residence, and while he suffered no serious injury, he was badly shaken up. Mf 84 -- Samuel Rankin Latta Diary, 1848-1857. 4 vols. TSLA. 1 reel. 35 mm. This collection consists of four journals and miscellaneous letters of Samuel Latta (1827-1911) from Westmoreland County, Pennsylvania. Latta records his activities as a student at Washington College in Pennsylvania, his move to Dyersburg, Tennessee, his marriage to Mary Guthrie, and comments on the Whig, Democratic, and Know-Nothing parties. He also describes his move to Tennessee in 1850, where he worked as an engineer and teacher in Dyer County. John (3) John (2) E____ (1). Born October 16, 1829, probably at New Alexandria, Pa. as his father did not leave there until 1837. Died at Dyersburg, Tenn. in 1857. Married ____. He was a saddle and harness maker. 34 SAMUEL JAMES (5) in 1890 lived at Memphis, Tenn.
John G. (4) John (3) John (2) E____ (1). Born March 21, 1876; d. 1947; buried in Parkholm Cemetery, LaGrange Park, Cook Co., Illinois; m. Mary William of Putnam, Ills. August 29, 1907. In 1912 lived at LaGrange, Ills. LATTA-WILLIAMS. At the home of the bride's parents, Mr. and Mrs. J. Howard Williams, near Putnam, Illinois, on Thursday, August 29, 1907, Samuel Wellman Latta, of La Grange, Ill., and Miss Mary Williams, the Rev. L. G. Landenberger officiating. 36 ROGER DASCOMB (6) b. August 7, 1909 d. 1922; buried in Parkholm Cemetery, LaGrange Park, Cook Co., Illinois. 37 JOHN DONALD (6) b. January 27, 1910. 38 PHILLIP RANKIN (6) b. January 14, 1911. 52 WILLIAM B. (b) b. Oct. 24, 1914; d. September 16, 2004 in Joliet, Illinois; m. June E. _____________. Buried in the Abraham Lincoln National Cemetery, Elwood, Wood Co., IL. Samuel R. (4) John (3) John (2) E____ (1). Born: June 21, 1857 Dyersburg, Tenn. Died: Dec. 27, 1925 Dyersburg, Tenn. Married: Leanora Lee Poland, Dec.6, 1882 at Marshall, Texas. She was Born: Aug 26,1859 in Texas. She died: March 22, 1951. She was the daughter of John Stratton Poland & Carrie Gray. In 1904 worked in a bank at Dyersburg, Tenn. 1920 Census - Dyersburg, Dyer Co., TN - Latta, John, age 62, born in TN. 39 NELLE (6) Born: Nov. 13, 1883 Texas. Died: Oct. 28, 1961 Texas. Married: Hampton Oscar Marley in 1907. 40 LESLIE VIRGINIA (6) Born: Apr. 26, 1886. Died: Jan. 30, 1967 Texas; m. Harry B. Watkins Aug. 15, 1907. 41 FLOY (6) Born: May 6, 1892 Dyersburg, Dyer Co., Tenn; m. Robert Jones, Sr. Dec. 19, 1911 Dyersburg, Dyer Co., Tenn. Two children: *1) Robert Jones Beasley Jr, Born: Jan. 26, 1913 In: Texas. & Dorothy Latta Beasley, Born: May 19, 1914. Texas. MARLEY & LATTA--The Cumberland Presbyterian church was the scene Tuesday evening of the beautiful Presbyterian ring ceremony said by Rev. Geo. P. SCOTT, united Miss Nelle LATTA, second daughter of Mr. & Mrs. John G. LATTA, of this city, and Hampton Oscar MARLEY, of Memphis. Her grandfather, Capt. S. R. LATTA, being one of the pioneers of this part of the State. The groom is also a native Tennessean and occupies a position of responsibility with Galloway Coal Company, Memphis. The audience was entertained with "The Budion Love Song.” and "Love Me, “ and "The World Is Mine.” sung by Mr. Granger LATTA and Miss Louise BRACKIN. Mrs. Robert McKNIGHT played Mendelsshon's wedding march as processional and Lohengrin's as recessional. The bridal party was preceded down the aisles by the little flower girls, Mary Granger GRIGSBY, Mary LATTA, Kate LATTA, and Belle LATTA, all dressed in dainty white dresses. They were followed by the attendants, Miss Floy LATTA, sister of the bride, Miss Kate GORDON, cousin of the bride, Miss Cano FERGUSON, Miss Janie COOVER, Miss Nell THOMAS, of this place and Miss Bertha WOOLLEN, of Memphis, gowned in white mulle over silk, with elaborate lace trimmings. The best man was F. N. MARLEY, of Memphis, brother of the groom, A. H. MURRAY, J. R. MURRAY, A. W. LAMBERT, J. A. WEBER, all of Memphis and H. B. WATKINS, Stoy DAWSON, W. O. GORDON, of Dyersburg, groomsmen. The matron og honor, Mrs. Albert Russell ERSKINE, of Memphis, cousin of the bride, preceded the maid of honor, Miss Leslie LATTA, the bride's sister. The bride entered on the arm of her father, John G. LATTA, who placed her in the keeping of the bridegroom at the Chancel. Her dark beauty was brought out to perfection by a handsome white duchesse satin gown with lace trimmings. The full length veil was caught with a wreath of orange blossoms. Immediately after the ceremony, an elaborate ceremony was tendered about 200 specially invited guests at the home of the bride's father. A perfect wealth of elegant gifts many from a distance, were received, among the handsomest being a chest of silver from S. Granger LATTA, an uncle of the bride. Mr. & Mrs. MARLEY left on the 9 o'clock train for a two weeks trip to Ashville and vicinity. ceremony will be said at the residence of the bride's parents, Mr. & Mrs.
LATTA & WATKINS--The wedding of Miss Leslie LATTA and Mr. Harry WATKINS, of this place, was solemnized at 6 p. m. Thursday at the home of the bride's parents, Mr. & Mrs. J. G. LATTA. Only the members of the two families and neighbors were present, the entire plans of the wedding changed because of the illness of the groom's father, Mr. B. B. WATKINS. Samuel Rankin (4) John (3) John (2) E____ (1). Born in 1866; died in 1936; m. Pearl Doyle at Dyersburg, TN in 1892. In 1929 was Mayor of Dyersburg. Frank and Pearl are buried at the Fairview Cemetery, Dyersburg, Dyer Co., TN. 1920 Census - Dyersburg, Dyer Co., Tennessee - Frank W. Latta, age 53, born in TN, wife Pearl, age 51, son Doyle, age 26, son James, age 21, daughter Belle, age 19, daughter Sadie, age 14. 47 DOYLE (6) b. 1893; d. 1921. Buried at the Fairview Cemetery, Dyersburg, TN. Samuel R. (4) John (3) John (2) E____ (1). Born 1871; d. 1934; m. Eveleen Pardoe. She was born in 1874 and died in 1963. Law partner with his father. In 1932 lived at 1356 Troy Ave., Dyersburg, Tenn. He and his wife, Eveleen are buried in the Mausoleum of the Fairview Cemetery, Dyersburg, Dyer Co., Tennessee. His grave marker reads "S. Granger Latta." 42 FRANKLIN W. (6) b. Aug. 4, 1897; d. Feb. 28, 1958; TN 2nd LT SC WWI; buried at the Fairview Cemetery, Dyersburg, TN. 43 GORDON G. (6) b. Sept 30, 1903; d. Apr. 8, 1977. Buried at the Fairview Cemetery, Dyersburg, Dyer Co., TN. 45 MARY E. (6) b. May 29, 1899; d. 1984; m. Homer Richards. 46 EVELEEN (6) b. 1905 at Dyersburg, Tenn.; d. January 26, 1933; m. Mr. Fowlkes. Lived in Tipton, Tenn. She was buried in the Mausoleum of the Fairview Cemetery, Dyersburg, Dyer Co., Tenn.
of March 1891. J W LAUDERDALE; Clerk & Master. S R LATTA, Sol.for Complainent. A SHORT SKETCH OF THE CORONATION: Editors Progress---Last Friday eve, I had the pleasure of attending the crowning of the May Queen at the Court House, (description of stage lengthy, will exclude). Music was rendered by these splendid amateur performers; Miss Fannie STEVENS, Miss Anna WEBB, Miss Ella BRACKIN, and Mr. J. M. BRACKIN.At last the Herald announced the approach of the Queen-elect, Miss Sadie LATTA, who was conducted to center stage by her attendants and crowned Queen O'the May by her first and second Maids of Honor; Misses Belle DIXON and Willie WATKINS. The Queen's pages were Misses Nellie WEBB and Mary STEVENS. Miss Dixie DAWSON represented Spring to perfection; Miss Mary BURKE was Summer; Autumn was Miss Manie WEBB. Winter was Miss Mary PHILLIPS. Little Minnie JONES acted the part of Gypsy Queen; the Woodland Favs were Katie SAMPSON and Katie McAllister. Misses Tommie DAWSON and Nora WALKER assumed the part of Night and Day. Lizzie HIBBETT and Pearl DOYLE were Water Sprites. Undine was Miss Ella FOARD. The Indian Princess was Julia SOLOMOM. The representative of Wealth was Miss Ella NEAL. Faith, Hope and Charity were Misses Georgia MILLER, Lou DOYLE and Lon PATE. Herald was Miss Ella MOSS. We cannot comment to highly upon the beautiful manner in which they acquitted themselves and must say the whole affair was the work of skilled hands. Suffice to say that the like was never before seen in a place the size of Dyersburg.N_______May 20th,1876. UNION REVIVAL BEGINS--Dr. George H. CRUTCHER opens the initial service with a talk on prayer. The choir, composed of some forty voices rendered a pleasing musical program. S. Granger LATTA, the leader, and the members of the choir deserve much praise. Mrs. R. L. McKNIGHT, as accompanist, is assisting Mr. LATTA. THURSDAY MARCH 14, 1907--Frank J. NUNN, of Brownsville, is in the city. Mrs. Henry A. KLYCE will entertain the Saturday Afternoon Club, March 23rd. Misses Virginia & Mackie SHUMATE, of Newbern, came down Monday evening to attend the Forked Deer Club dance. Miss Annie ARNOLD leaves for Paducah in a few days, the guest of Miss Clyde BARHAM. Mrs. John LATTA and Miss Leslie have returned from a visit to Memphis. Ernest GWARTNEY spent several days this week in St. Louis. Will Dock FOWKLES is quite ill with pneumonia. Mrs. H. J. RICHARDS entertained with six hand euchre Saturday evening. Miss Kate GORDON won first prize and Miss Nell LATTA won the consolation. ...John G. LATTA and S. Granger LATTA were last Sunday elected superintendent and assistant superintendent of the Presbyterian Sunday School. Samuel Granger (5) Samuel R. (4) John (3) John (2) E____ (1). Born Aug. 4, 1897; d. Feb. 28, 1958; m. Ruth Fumbranks. She was born Dec. 4, 1899 and died Dec. 25, 1992. They are buried at the Fairview Cemetery, Dyersburg, Tenn.
53 SAMUEL GRANGER (7) b. Sept. 4 1921; d. Dec. 21, 1980; married Margaret Thompson on Sept. 17, 1948; buried in Piedmont, AL. 54 RUTH FUMBANKS (7) b. Jan. 10, 1923; d. Feb. 10, 2001; married Richard Leow on Nov. 2, 1943; buried in Fairview Cemetery, Dyersburg, TN. 55 BETTY NEELY (7) b. Oct. 17, 1925; d. Nov. 3, 2012; married Charles Ratcliffe on July 11, 1947; buried in Natchez, MS.
56 JANE EYRE (7) LIVING. have thought so then, but has suspected since that there was some slyness in it. he attended the Blairsville Academy for five months and the following winter taught another five months session at McClellands. The following summer he taught a five month's session in the public school at Blairsville, as assistant teacher, at $20.00 per month, and the next winter at Youngstown, a village in Westmoreland County at $25.00 per month. Having now made enough money to try college, in the spring of 1848, he entered Washington College at Washington, Penn., entering the Junior class half-advanced. At the end of the first five month's session, the whole of the junior class rebelled against the faculty, on account of their suspension of one of their number, and refusing to attend recitations, the whole class was suspended. Part of the class bought their peace by yielding to the demands of the faculty. These were such students as were subject to and dependent upon parental authority. About half of the class, among them the writer, refused to submit and left school, and were suspended. In a short time they were all admitted into Jefferson College at Cannonsburg, Pa., and graduated in the summer of 1850. In the fall of that year, he found employment as a chain carrier with a party of engineers and engaged in surveying the route of the Pennsylvania Central Railroad, on the eastern slope of the Allegheny mountains, from Altoona to the top of the mountains. The new flourishing town of Altoona, at that time, consisted of one whiskey shop. While thus engaged with the surveyors, the writer earned $1.00 per day and accumulated about $40.00., and then determined to go south, where the wages of teaching were better. So about the middle of October he left home, traveling down the Ohio from Pittsburg by steamboat. He took passage to Memphis, expecting to teach in West Tennessee or North Mississippi but on his way down the Ohio, hearing of several situations in West Tennessee, where he might find employment, he stopped at Hickman, Kentucky, and carrying a carpet bag weighing at least forty pounds, he walked from there to Dyersburg, a distance of fifty miles. He obtained employment as a teacher in the public academy and continued to teach for three years. His wages as a teacher during those years varied somewhat, averaging perhaps about $60.00 per month. In 1852, he purchased the piece of land about half a mile north of the town of Dyersburg, where he now lives, (1886), built a little house upon it, and in December of that year, he married Miss Mary Granger Guthrie, at Eaton in Gibson County, Tennessee, and brought his young wife to that little house. The house has grown as their family increased, but they have never changed their residence, nor do they expect to do so, until they are called home. While teaching, he had been studying Law, and in the summer of 1854 he was admitted to the bar at Dyersburg, and at once entered on the practice of his profession in partnership with his preceptor, T. E. Richardson, Esq. He continued the practice of his profession actively and successfully until the breaking out of the Civil War. His sympathies were warmly with the south, and in May 1861, he assisted in raising a company of twelve months volunteers, of which he was elected captain, and joined the Tennessee troops, then under the command of General Gedion J. Pillow at Randolph on the Mississippi River, where he and his company were mustered into service. At the Battle of Belmont, in Missouri, his company which was in the 13th. Tennessee regiment, was engaged and lost three killed and twelve wounded, among the latter, himself slightly. Again at the Battle of Shiloh or Pittsburg Landing, his company were engaged, and suffered severely in killed and wounded. After this battle, his time having expired, he was discharged and his health and the situation of his family forbade his again entering the service, and he remained at home during the remainder of the war, though his sympathies were as much as ever with the South. After the war he resumed the practice of his profession actively and profitably, but in the flush times succeeding the war he indulged in buying real estate, and in the crash of 1873 and succeeding years, he suffered severely, though never to insolvency. Mary Granger Guthrie, his wife, was born on the 8th. day of August 1833, at Bright Hope Furnace in Green County, East Tennessee. Her father was John Guthrie, one of the proprietors of that furnace. He was a Scotchman by birth and education, but the time and place of his birth are unknown to her. Her mother's name was Minerva Wear, a daughter of Samuel Wear. John Guthrie Latta, the oldest son, was married to Miss Lee Poland in Marshall, Texas, on the sixth day of December, 1882, and to them have been born two children, -Leslie, a daughter, born at Marshall, Texas, Nov. 1883, and Nell, a daughter, born at Dyersburg, Tenn., April 24, 1886. Kate the second child of Samuel R. and Mary G. Latta, intermarried with Thomas C. Gordon, at Dyersburg, Tenn., on the 25th. of June 1879 and to them have been born thus far (1886) three children, thus: Mary, born April 26th. 1880 Winfield Osceola, born January the 21st. 1882 Sadie Louise, born July 27th 1884. Returning to the Latta family: John G. the eldest son, as before stated, learned his trade with his father in Blairsville, Pa. but in the year 1852, his health having somewhat failed, he came to Tennessee, and taught school in Dyer county for over a year. In the summer of 1854, Samuel R. and his wife and John G. Latta visited their parents in Pennsylvania, and the next year the old people, with their son William B. and their son James M. and his wife and child all removed to Dyersburg, Tenn., and James G and James M. Entered into partnership, in carrying on their business of saddlery. A short time after his parents came to Tennessee, Samuel R. enlarged his house and took his father, mother and brother Wm. B into his family, and with him they lived until their deaths many years afterwards. Of the latter, it can only be said, that he was of weak mind. He remained, mentally always a child, and was never capable of taking care of himself. He lived with his parents, and with his brother Samuel, up to the time of his death John G. Latta, the oldest of the brothers, married in the year 1861 or 1862, Miss Mary Silsby. She was a New England woman and was visiting her brother Mr. Howard Silsby, when he made her acquaintance. In 1862, he took his wife and first born child to Newton, Mass., the residence of her parents, and shortly afterwards was appointed post master of that city, and has so remained until now, 1886. By his wife, Mary Silsby, there was born to him the following children: First: Lilian, born in the year 1861; Second: Florence, born about the year 1863; Third: Mary, born about the year 1865; Fourth: Jennie, born about the year 1867. The latter died quite young. The others are all alive. His wife, Mary Silsby, died about the year 1869, and a year or so afterwards, he married Miss Nellie----, by whom he had two sons, one of whom died in infancy and the other named Samuel, still survives. James Mitchell Latta, while carrying on his business successfully died at Dyersburg on the 27th of September 1857, and was buried at Hurricane Hill Church, about five miles north of Dyersburg, Tenn. He left two children and his widow surviving him. Lucy, the oldest of his children, was born at Blairsville, PA., about the year 1853, and intermarried with John G. Seat, at Dyersburg, Tenn. about the year 1874 or 5. They still reside in Dyersburg and have three children: Glenn, a boy about thirteen, Birdie, a girl aged about eleven and a third child (daughter) born to them a few days ago. Samuel R. Latta, and his wife, Mary have now (December 1886) been married, nearly thirty four years. They were married December 1852. They are yet occupying the same house in which in their young days, they began housekeeping, though it has been enlarged as their family increased. It is situated about half a mile north of the village of Dyersburg, and the same forest trees are still around it, amid which it was originally built. Although West Tennessee has always been regarded as an unhealthy country the family has always had good health. Death, has never entered their home. They have always had enough to eat and wear and in all things have always had enough to eat and wear and in all things have always had abundant cause for thankfulness to a kind Creator for unnumbered blessings. mentioned his son, Samuel James Latta, born in Dyersburg, Tenn., in the year 1857. In the year 1885 he married Miss Betty Cowan of Memphis, Tenn., and is now residing in that city. I have written the above brief history, that my children and their descendants may know more of their mother and father, and their kinsmen, than I know of mine. The question might well be asked--"cui bono". Well, it is hard to say. It may satisfy some curiosity, at least. There is something in each one of us that prompts the quere, "who was my father? Who was my grand-father or my grand-mother? And if one can trace back their lineage, through a long line of ancestors they are disposed to boast themselves upon it. This perhaps is well. But again the question comes, "cui bono"? Where is now the descendants of Caesar or Alexander? Or of more recent days, where is now the family of Washington, or who cares for them? Victoria, queen of England, may be able to trace back her history through many names, but what is there to boasting it? Not a name in the whole line as illustrious as that of Washington or Lincoln. And how far back can the name Lincoln be traced? Or a hundred years from now, who may be able to trace to him, their parentage? We have in our family bible printed in the year 1601, in London. It is in old English type. It is now owned by John G. Latta, as the oldest son of our father. There is in it some family records, of which we know nothing. About all that can be learned, is that we have been a Protestant family for many years, but that is all. Our grand-father came from Ireland; that we know. But where did they come to Ireland from? It is more of a Welsh name, than Irish, but if they came from Wales to Ireland, from whence came they to Wales? Who can tell, and why should anyone care to know? Still, the world is prone to pride itself, upon its ancestry, but for what good reason, it is difficult to tell. This is true, that it is important that each individual should so well act his or her part on the stage of life, as to leave their posterity and to the world, an untarnished name. In doing this, they have more to boast of, than they could possibly have, by ability to boast of a long line of ancestry, however distinguished that ancestry may have been. For all that however, it would be a matter of great pleasure to me, if I could have, even a brief history of my ancestors, telling me of their lives, and actions; where and how they lived, who were their ancestors, and where they lived. Such a record may have once been prepared, just as this is, who can tell? And a hundred years from now, this may be as unknown as if it had never been written. Who can answer for it? No one. Some of my children, or my grand children may some day read this, and add to it their history for their children. And it may thus go down from father to son, or in a few brief years there may be no one who will care for it at all. Well, so be it. In an idle time, July 11, 1906, I have re-read this. It is about twenty years since I wrote it. We are all living and well. My grand-children number twenty-five in all all living. Three died in infancy. Our great-grand-child, Gordon Pelham, a bright boy, son of our oldest daughter's daughter, Mrs. Kate Gordon, has been born to us. My wife and I are still living in the same old house where we began. Today, we are expecting our daughter, Sadie K. Anderson, wife of Rev. Dr. W. M. Anderson, pastor of the first Presbyterian church at Nashville, Tenn. with her six boys, to spend a month in the old house with us. When she arrives, my whole family will be here -- not one missing -- except Dr. Anderson, numbering in all, -- parents, children, and grand-children, and great-grand-children, forty souls - less one, Dr. Anderson being the only missing one. A very special thank you to Sarah Hutcherson, who transcribed The State Gazette newspaper articles and for consenting to our using them on this web site.